Stock photo of a penguin dressed like a Canadian Mountie in front of a souvenir store in Ottawa, Ontario, Canada. Souvenir RCMP dress at Canadian Fine Crafts shop in Ottawa, Ontario, Canada. Penguin Mountie at the entrance to a souvenir store in downtown Ottawa, Ontario, Canada. 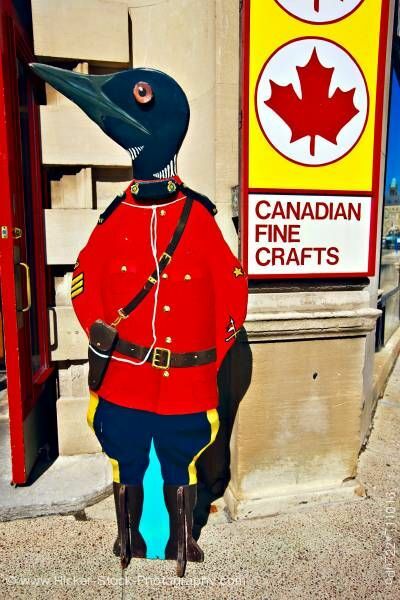 This stock photo shows a wooden penguin dressed in a original Canadian Mountie uniform in front of a souvenir shop in downtown Ottawa, Ontario, Canada.